IdealTrim is an ultimate appetite suppressant in supplement form, and provides additional fat loss benefits. It combines two powerful ingredients to help you crush cravings and take control of your eating choices: Slendesta® and Garcinia Cambogia. IdealTrim is the perfect tool to help you avoid dinner time overeating, put nighttime snack attacks to bed or control cravings WHENEVER! And, because IdealTrim doesn't contain any stimulants, you don't have to worry about it keeping you up at night. It also delivers the weight loss and health benefits with Buchu Leaf, Dandelion Root, Uva Ursi, and Vitamins B6 and B12 to help your flush out excess water. IdealTrim is a great complement to the IdealPlan to reach your weight loss goals faster. Suggested Use: Take two (2) capsules once a day with 16oz of water. Use before dinner or when you struggle to control your appetite most. For best results, use daily. Not only are vitamins B6 and B12 essential to overall health, they play an important role in weight loss. Yet according to Tufts University, at least 40% of Americans aren’t getting enough B vitamins. Vitamins B6 and B12 are known to facilitate energy metabolism, helping your body process the nutrients you eat and convert them into energy. Metabolism goes hand in hand with energy levels, so B vitamins also help you feel “on top of your game” every day. On the other hand, feeling sluggish (a side effect of B vitamin deficiency) can make it hard to stay physically active and motivated on your weight loss journey. Because “energy” and “metabolism” are two magic words when it comes to achieving your ideal shape, IdealTrim helps to ensure you’re getting the B’s your body needs. An important component of weight loss is helping the body let go of water weight. IdealTrim’s weight loss blend is designed to reduce bloating and help promote a healthy urinary tract by combining the natural diuretic benefits of Buchu Leaf, Dandelion Root and Uva Ursi. These ingredients are all derived from plants and found to improve urinary tract health and support the secretion of excess water. Vitamin B6 also helps with fluid retention. Slendesta is the same unique hunger-blocker used in IdealShake, IdealBars and IdealBoost. It’s a potato protein extract that triggers the natural release of the hormone CCK, telling your brain that you’re full. Slendesta is proven to replace feelings of unnecessary hunger with feelings of satisfaction for up to three hours. Garcinia Cambogia is the other unique ingredient in this hunger control blend. By improving blood glucose levels, it helps tame sugar cravings and prevents excess blood glucose from being converted to fat. 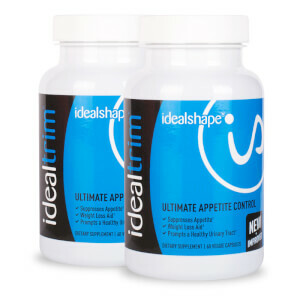 IdealTrim's appetite suppressant pills give you enhanced appetite control when you need it most! Garcinia Cambogia has a high concentration of Hydroxycitric Acid (HCA), which helps to balance blood glucose levels in the body. This controls sugar cravings and prevents excess blood glucose from being converted into fat. It also has an appetite suppressing effect. Dandelion Root contains powerful diuretic compounds called taraxasterols that support the natural release of excess water. Dandelion is one of the most popular natural diuretics, helping the body get rid of excess fluids to reduce bloating and shed water weight. Uva Ursi is a plant also known as “bearberry.” It has been used as an herbal remedy for centuries to promote a healthy urinary tract and improve bladder function, so the body can let go of excess water. It’s most effective when combined with dandelion root.